Location : 1/G1 SIPCOT IT Park, Siruseri, Navalur post,Chennai - 603 103. TATA Consultancy Services is the first major Indian software company located at various state capitals and towns. 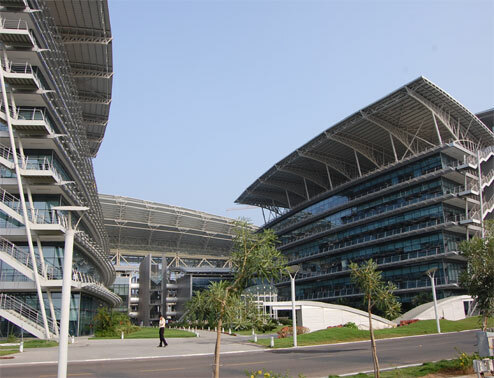 In order to meet the huge software requirements in the world market, TCS planned to set up big Campus at Chennai to house about 25000 Software professionals. During the course of its design, the campus evolved itself as one of the biggest in Asia comprising of 6 Engineering Blocks, 12 General Services, Customer care block with 120 m Height tower, Training and Auditorium, Club house and Recreational facilities. A Huge library is positioned in the middle of water body and the access is given from the second floor of Training through circular type Air conditioned Bridge. In addition to the training Centre, 1200 seater Auditorium with two levels of seating and Buffet at two levels in the training Centre is also provided.